In the rancho period, churches were a long distance from the homes of the rancheros. The nearest church to Rancho Boca de Santa Monica was the Plaza Church in Los Angeles. It was 15 miles away and nearly a day’s travel by horse or oxcart. This made funerals a difficult proposition. To solve that problem, Francisco Marquez set aside a portion of land in an empty field near his house for a cemetery. Although the family kept no records, it appears that the first burials were in 1840 and included Marquez’s children, who died as infants. In 1886, St. Monica’s Church was built. It became the closest church to the rancho. 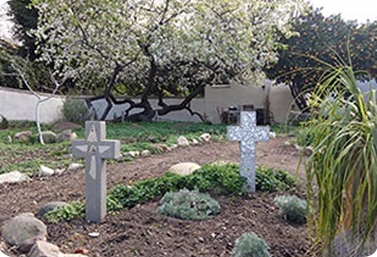 St. Monica’s began keeping birth and burial records. From that time on, it was possible to find the names of those buried in the cemetery. Unfortunately, the actual location of the individual graves is not known. Graves were marked with wooden crosses, which after time rotted away or were taken from the graves. After copious research, we have been able to discover the names of early 50 of the interred. There may be more. When Francisco Marquez died, his land was divided equally among his six children. His son Pascual received the portion that included the family cemetery. The Pascual Marquez Family Cemetery is named in his honor. In 1916, Pascual Marquez died. He was the last person buried in the cemetery. By this time, the cemetery had expanded to encompass the ruins of Pascual’s family home. When he died, his children put his grave in the same place and the exact angle as the bed in which he was born. His headstone reads recuerdos de sus hijos, memories of his children. On New Year’s Eve in 1910, Dionisia Garcia, daughter of Francisco Marquez’s widow and her second husband, Anselmo Garcia, prepared a large feast for the whole family. Canned peaches were on the menu for dessert. Within hours after consuming the peaches, the group began to feel severe stomach pains. There was fear and panic. Nobody knew what was happening. Nobody suspected that the peaches were the killers. It was only after doctors had the peaches tested that they found the cause. Over the next couple of days, 13 family members died, including an infant who had not eaten the fruit, but who died of pneumonia after being left unattended by an open window. The mass funeral was held at St. Monica’s church. So many people came to express their grief that the crowd overflowed into the street. Four horse-drawn hearses carried 10 flower-covered caskets to the church. After the services, the procession left for the cemetery. A long trench was waiting to receive the caskets.